With their 12th LP, Depeche Mode do the obvious thing and write a Depeche Mode album. It's probably safe to say that most of us aren't expecting Depeche Mode to blow our minds anymore. Which isn't to take away from the many excellent songs they've produced over the years, or the undeniable influence they've had in shaping the modern pop landscape. It's just that this band, along with the Cure, R.E.M., and any other band that was awarded its canonization when the first wave of post-punk was still stalking the underground, is nearing a time in its lifespan where we've really gotten to know them. Anyone who's paid even a bit of attention to Depeche Mode over their nearly three-decade-long career is as familiar with Dave Gahan's dramatic baritone, Martin Gore's baroque-inflected songwriting, and the band's darkly romantic approach to electronic pop as they are with the half-irritating, half-endearing manneristic ticks of an old friend. In other words, with every record they produce, it becomes more and more difficult for Depeche Mode to write anything but a Depeche Mode record. So let me save you some time: Sounds of the Universe is, for all intents and purposes, a Depeche Mode record. This band, barring some sort of drug relapse or internal feud, has been around for far too long and has too solid an understanding of what works and what doesn't to write a truly bad album, and, if you're a fan, your enjoyment of this one is going to fluctuate based on what you like about Depeche Mode, but only gently, because everything you like about Depeche Mode is represented here in some form. 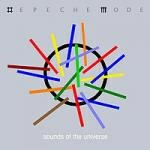 What we get on Sounds of the Universe is less the concise dark pop that defines Depeche Mode's best work, and more the expansive atmosphere that defines their ho-hum mid-'90s output -- something of a let down after the vital, empowering flashes of energy that comprised Playing the Angel's better half. And while a downtempo aesthetic isn't an inherently bad thing, even for a band who's best known for the much more vibrant melancholy of tunes like "Enjoy the Silence", it can get a little frustrating when you're sitting there waiting for a track to explode, only to realize, oh, that thing I just heard was the chorus. But once you wrap your head around what the band's going for, it can work: opener "In Chains" and follow-up "Hole to Feed" (one of the three tracks on this album penned by Gahan and his songwriting team) show us a Depeche Mode more than at home in their more restrained approach. Both songs have a subtle, deliberate build that never crashes through the roof and, crucially, doesn't care to, relying instead on stark, Portishead guitar figures and murmuring electronic miscellany to fill in the empty alcoves. And while Sounds of the Universe is generally more interested in taking you on long walks through damp weather and pseudo-industrial landscapes than getting you to dance, these tunes do occasionally take the form of more traditional, compact pop. Lead single "Wrong", while surprisingly bereft of the potent, sometimes breathtaking hooks that Depeche Mode singles are known for, showcases the band at their most aggressively dystopian, harsh synths throbbing to the point where they seem ready to collapse into each other. "In Sympathy", on the other hand, flirts with the more up-tempo, romantic Depeche Mode of Some Great Reward, trading in vaguely claustrophobic atmosphere for crystalline electronics augmented by equally crystalline guitars, coalescing into a magnetic, dramatic chorus. It's a song that, while not the band's best work, is certainly haunted (in a good way) by the band's best work, and reminds us why we still come back every time they throw together another set of songs, nurturing hope that they've somehow managed to tap into that old transcendence. But, as is only natural for a band whose identity has been firmly defined and in place for a few decades, they don't. Instead, they tempt us with a strong first half and then dump us in a collection of tossed off b-sides. The songs that compose the latter part of Sounds of the Universe are a formless sort of musical vapor, tracks wandering languidly, blending into each other, and rarely finding a shape of their own before dissipating. Sure, Gore's trademark aesthetic is still visible and as accessible as ever, and the hooks do occasionally manage to stick, but it often seems as if "Come Back" and "Jezebel" aren't doing anything but sticking. Take a closer look, and you'll find that Gahan's always rich vocals might as well be accompanied by nothing but a metronome for all that the usual bleeps and boops and stars-in-the-night-sky atmospherics bring to these songs -- and that Depeche Mode, for all the tricks they've learned over the years, could use a refresher in self-editing. So, what we've got here is a record that, despite its handful of peaks and songwriting that's capable at worst, registers in fairly neutral territory, a record that's going to be mostly defined by how you feel about the words "Depeche" and "Mode". If you're looking for proof that this band still has it in them after all these years, then you'll probably find it. If you're looking for evidence of staleness crusting around its edges, then you'll probably find that too. And if you're looking for a record that -- warts and all -- could only have come from one band, then you'll most certainly find that. Just don't expect them to blow your mind the way they used to when you were just getting to know them.